Sitting atop the highest point on beautiful Winding Bay, Point o’Vue offers breathtaking vistas of this private, secluded pink sand beach on the island of Eleuthera. A destination for visitors from all over the world for 15 years, Point o’Vue welcomes you to visit for an extraordinary getaway. Point o’Vue is nestled among casuarina trees and palms opening onto 2 miles of beach and the shallow blue-green waters of Winding Bay, offering 3,100 square feet of luxury and privacy, allowing you to spread out among the 3 bedrooms and 4 full bathrooms. The house includes a beautiful and spacious ground-floor master suite with King Bed, full bath and large closet, 2 upstairs bedrooms (one king bed, one with twin beds) each with their own bathroom and separate entrance onto the 2nd floor sun deck. Comfortable bunk beds (ideally suited for children) have been recently added in our private office space off of the Great Room. Designed by a famous Bahamian architect, the charming house has air conditioning throughout and ample storage space. Point o’Vue has unique exterior architectural features; ten foot verandahs surround the house and are perfectly suited for reading, relaxing and dining. The back patio area is a wonderful place for bird watching and listening to our fountain surrounded by lush, tropical plants, and is great for sunning on windy days. On the 2nd floor, Point o’Vue has a 60 foot sundeck that extends the length of the house and affords beautiful, expansive views of the entire bay during the day, and an extraordinary panorama of stars at night. There are lounge chairs and a table with umbrella on the sun deck for you to enjoy. Point o’Vue has a large, spacious Great Room with sliding doors on either side to allow for cool breezes and crosswinds to come through while you lounge on comfortable couches, watch satellite TV or enjoy many of the games, DVDs, and free wi-fi that Point o’ Vue offers. Its cathedral ceilings and white-washed walls offer a grand, open space for relaxing. The kitchen, open to the Great Room, is bright and open with sunny yellow cabinetry, a stainless steel stove and new refrigerator. While you prepare fresh caught fish, lobster or conch, others can sit at one of the high-top barstools and enjoy a cool beverage. Tessa Hunt, our amazing housekeeper and cook, and Columbus Carey, our long time house manager are there to serve you, assisting with car rental, meeting you at the airport, arranging picnics and helping with local knowledge. They are there to make sure you enjoy every moment of your island getaway. Point o’Vue offers 2 paddleboards and 2 kayaks for your enjoyment during your stay, as well as 2 new bikes with baskets for those who would like to bike into Tarpum Bay (just a few miles away). A beach cabana sits at the end of a winding path to the beach, with a table and benches for beach picnics or lounging while taking in the views. Winding Bay itself is perfect for easy snorkeling and fishing. Tarpum Bay settlement and the nearby settlement of Rock Sound offers markets for food shopping, gas stations and other basic necessities. For all of our guests at Point o’Vue, we provide a full write-up of recommended restaurants to visit, beaches to explore, and things to do while on Eleuthera Island. The owners have extensive knowledge on all aspects of Eleuthera living including finding flights to and from the island for the best price. We highly recommend Rock Sound airport (RSD), which is 10 minutes away from the house, or Governor's Harbour airport (GHB), which is 30 minutes from the house. When in doubt, please ask owners to assist with travel planning as you also look into booking POV. We have helped many guests for years. Point o’Vue is family friendly and the owners’ children and grandchildren have grown up on the shores playing in the sand, body surfing, snorkeling and shelling. Eleuthera is a paradise and playground for all ages. Let us welcome you, take you away and introduce you to a whole new Point o’Vue of what island living is all about. 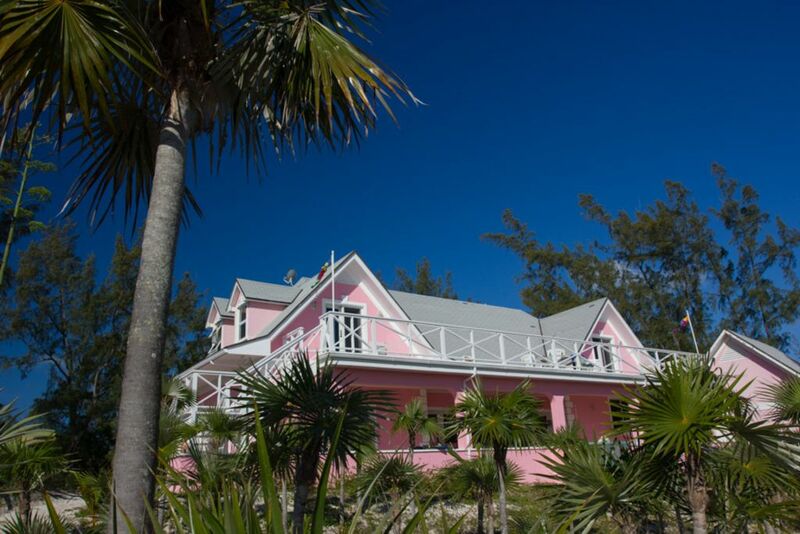 The owners, Marty and Lynnie Erbaugh, built this beautiful home in 1991 after travelling to Eleuthera for over 25 years. With the help of an acclaimed Bahamian architect, they built a home and retreat they can enjoy with family and friends as well as a place to welcome others. Their three daughters grew up on the bay shelling, playing in the waves and building sandcastles and now they are bringing their children down to experience the beauty and adventures that Eleuthera has to offer. This home has hosted guests from all over the world for the past 15 years and many people continue to come back after their first visit, falling in love like Marty and Lynnie did so many years ago. Marty and Lynnie, and now Marty's daughters, have extensive knowledge about the island and how to make the island experience perfect for you. In fact, one of Marty's daughters got married down on Eleuthera, welcoming 90 guests! We know restaurants, beaches, off the beaten path places to see and more. We can assist with car rental and air fare as well. For all of our guests, we provide a detailed write up that can help you plan your trip. We can't wait to talk to you about Point o'Vue! We love to share stories and hear from all of our guests as everyone who visits has become like family. Overlooking the Atlantic Ocean, Winding Bay is a 2 1/2 mile stretch of beach at the south central point of Eleuthera Island. Winding Bay is protected by Joseph’s Cay, which guests will see from the veranda stretching far to the right. Winding Bay is perfect for beach strolls, shelling, snorkeling and diving. A small reef resides inside the bay where you will see small fish, star fish, a manta ray and if lucky, you will see sea turtles. In front of the house down at the beach there is a cabana for you to enjoy with a table for picnics or afternoon drinks. If you would like more protection from the Atlantic breezes, you can walk or drive around the bay to “Richard’s Beach” for a picnic. Richard’s Beach is directly across from the house when looking out onto the bay from the veranda. Visitors can also walk past Joseph’s Cay and explore the beaches that lead to the entrance to Half Sound. Our family has enjoyed picnics, kayaking, water skiing and shelling in this incredibly beautiful body of water. The home is nestled among casuarina trees and palms to open up onto 2 miles of pink sand beach and the shallow blue-green waters of Winding Bay, Eleuthera. Guests can dine indoors or outdoors on patio overlooking the bay.